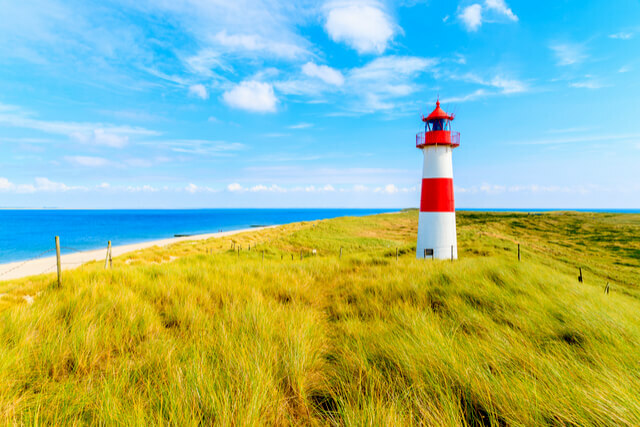 With a profound amount of rich history, idyllic countrysides, quaint towns dressed in half-timber architecture, and jaw-dropping nightlife scenes, searching for the best things to do in Germany can be overwhelming. If you’re not keen on tourist-traps and checking off the obligatory sights, consider exploring the country’s hidden gems. Here’s a list of 10 spots that are off the beaten path yet quintessentially German. 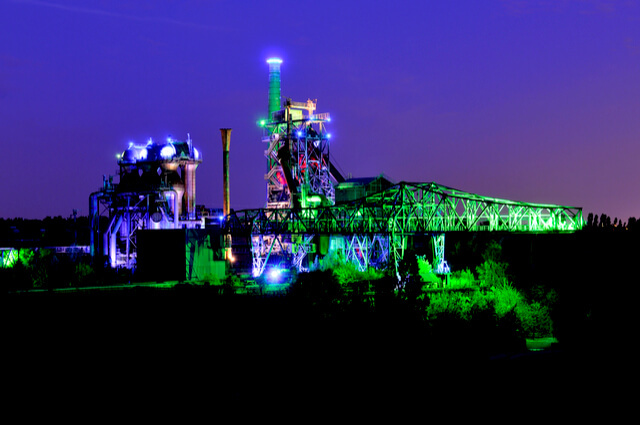 Taking a page out of Berghain’s book on repurposing old power plants, Landschaftspark Duisburg-Nord is an abandoned coal and steel production plant beautifully redesigned as a public park to host festivals and sports events. Instead of ditching the past, the park’s designers sought to keep the site’s originality for its aesthetic. The result has been an ecological transformation of an industrial monument. Stroll through botanical gardens, learn to scuba dive in the plant’s old gasometer, and listen to live music in one of West Germany’s best-hidden gems. Nestled at the Northern foot of the Swiss Alps, on the banks of Europe’s third-largest lake, lies Konstanz, one of Germany’s go-to summer getaway spots. 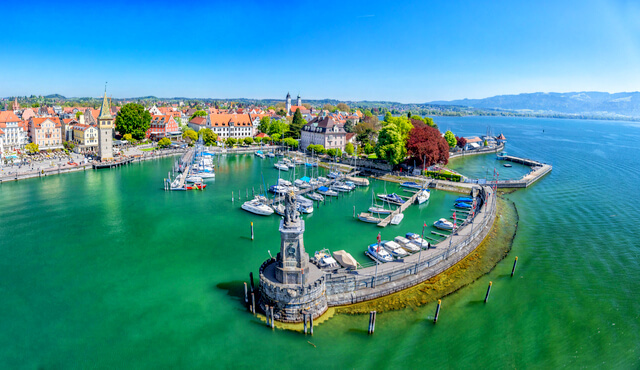 Konstanz is a funky blend of themes: charming pre-WWII architecture, university town spirit, beach volleyball culture, Mediterranean vibes, and historical landmarks stretching back to Medieval times. Activities include island hopping, wine festivals, air-bound Zeppelin tours and a lively cafe culture centered around the harbor. If your visit to Germany needs a sprinkle of fairytale flair and architectural awe, touring a centuries-old castle will do just the trick. 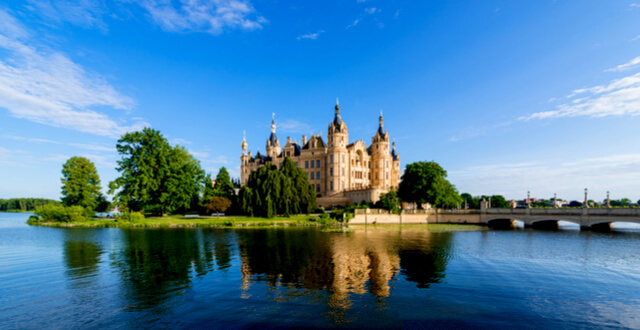 Germany is a country known for its illustrious network of castles, and the Schwerin castle is surprisingly somewhat of a hidden gem. Perched on a picturesque little island, the castle offers rich history by way of knights, grand dukes, and devastating wars. If you visit Schwerin, be on the lookout for Petermännchen, the resident ghost who has been known to dress in 17th-century clothes. 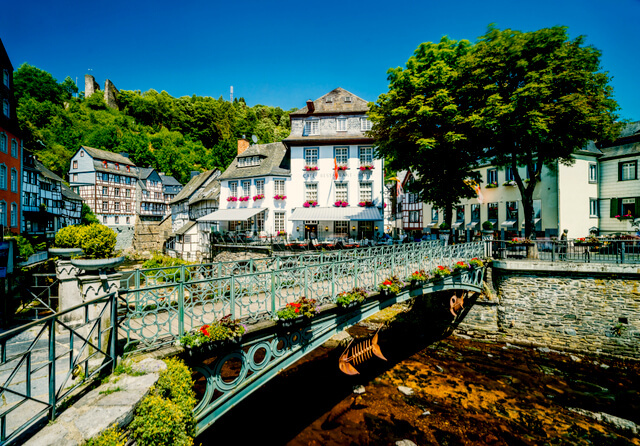 Monschau champions as the best small town on our list of Germany’s hidden gems. Although larger cities in Germany certainly have their own appeal, travelers would certainly miss out by overlooking the smaller towns. In Monschau, time seems to have stood still for three centuries. Cradled in the woods and filled with meandering rivers, the town is known for its half-timbered buildings, romantic narrow streets, and Medieval walls. It’s the perfect place for a quiet, restful holiday, as well as a great home base to explore the Eifel region’s surrounding national parks. If there’s one thing Europe does best — one thing that it has meticulously mastered on all levels — it’s a bridge. Who knew that something as simple as a connecting structure could be so awe-inspiring? Based on downright beauty and proximity to one another, we’re sneaking in two gems here for the price of one. 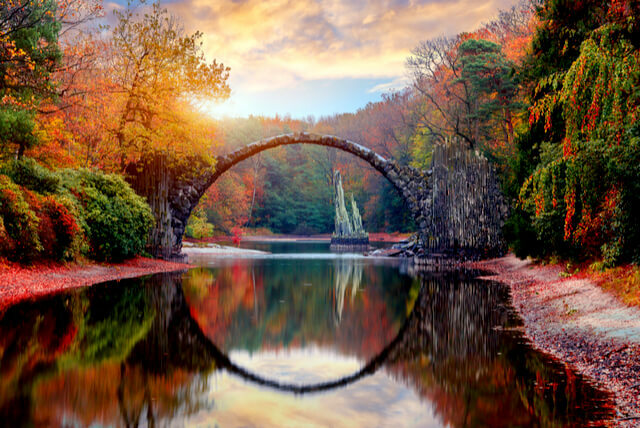 Basteibrücke for its breathtaking Land Before Time backdrop and towering height over the Elbe river, and Rakotzbrücke for its arch, reflection, and feel as a truly hidden backcountry gem. Seriously. Image search these two — they’re a must-see. 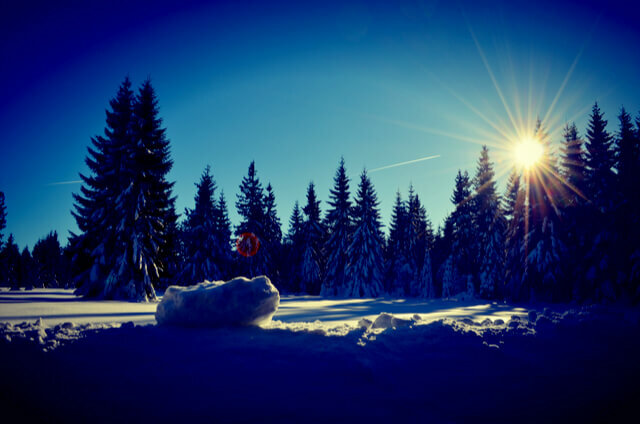 The 100-mile stretch of mountains straddling the German-Czech border is referred to as the “cradle of Christmas” because the region transforms into a magical winter wonderland come December. Cross-country ski in perfect conditions around Fichtelberg Mountain, witness professional wood-carving in the postcard-worthy town of Seiffen and walk through a festival of lights in Schneeberg. On the far North coast of Germany lies a collection of 10 islands which have been all but forgotten by the rest of the country. The wall that was erected to prevent flooding effectively keeps out both water and modern society. Most residents are cattle farmers that live without WiFi, television, and cell phone reception. There are no inns or hotels on the islands, so the only way to stay overnight is to ask a local for a guest room. One of the most daring opportunities in Halligen is to walk between the islands when the tide moves out. Time your journey correctly! Tides come back with short notice and quicksand has been known to swallow careless tourists. In a country not best known for its beaches and picturesque water, Blautopf is sure to change your perception. The vibrantly turquoise pocket of water gets its color from the dense amount of limestone and flows into the Danube river. Blautopf is a must-visit if you’re looking to complement your tour of Germany with something more tropical. Having just one castle on our list of Germany’s hidden gems wouldn’t do the country justice. 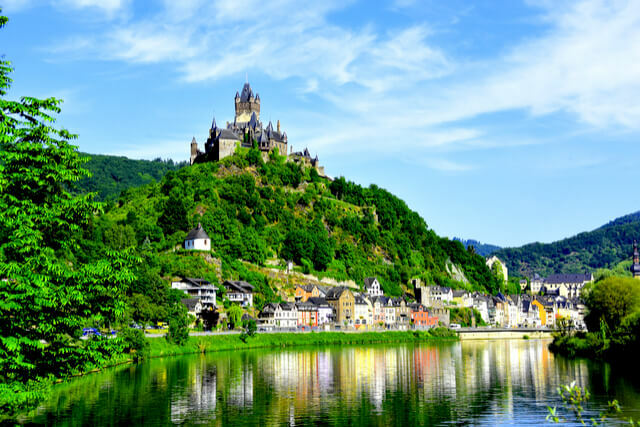 Cochem, the tiny town dating back to Roman and Celtic times, will probably provide you with your fair share of misty-castle-perched-on-mountaintop vibes. If you can visit in fall when the foliage is on the move. The castle is surrounded by vineyards, interesting historical buildings, and the Moselle River. Squeezed among the Bavarian Alps are Germany’s highest alpine lake and a strong competitor for the country’s best hike. Depending on when you visit, Schrecksee can have a character ranging from intimidatingly dark and treacherous to a kind of rustic green-hill blue-sky paradise. Both seasons are great times to visit.